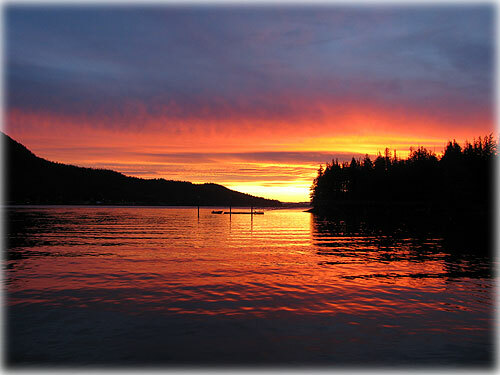 Looking from Pennock Island down east Tongass Narrows toward Mountain Point. This photo was taken on Saturday, December 26, 2009. Alaska: Research Report Reveals Magnitude of Refiner Price Gouging in Alaska - Senator Bill Wielechowski (D-Anchorage) today released a research report prepared by the non-partisan Legislative Research Services Division that conclusively shows that price gouging by Alaskan refiners has continued unabated, and the average refiner margin in Alaska in August 2009 is twice the national average. "During the last legislative session we were assured by a Tesoro representative that Alaskan gasoline prices were merely lagging behind those of the lower forty eight, and that they would soon come down," said Wielechowski. "These charts show that the refiners have continued to jack up the price of gas, even when the price of crude oil has gone down." The refiner margin is very roughly the profit earnings, plus some costs, for a refiner. Tesoro and Flint Hills Refiners provide virtually all the refined gasoline for Alaska, with Tesoro dominating the gasoline refining, with over 80% of the market. According to the American Automobile Association, Alaska still has the highest gasoline prices in the nation today. The Research Report shows refiner margin trends in Alaska, Washington and the United States since 2004. From January 2004 through July 2008, the refinery margins in Alaska have roughly tracked the refiner margins in Washington and the United States, with occasional fluctuations. However, when the price of oil spiked in the summer of 2008, Alaskan refiner margins exploded to $1.45 per gallon by October 2008, while the Washington and US average refiner margin peaked at 60 and 63 cents, respectively, in September 2008. In November 2008, the Washington and US average refiner margins hovered at around 10 cents per gallon, while Alaska's refiner margin remained over 10 times higher, at $1.17 per gallon. As the Alaska legislative session progressed, and price gouging bills continued to be debated over Tesoro's and Flint Hills strong objections, the refiner margin difference narrowed. After the session ended in April, Alaska refiner margins dropped for two more months, hitting a low of 78 cents per gallon in June 2009, while the Washington refiner margin was 54 cents per gallon, and the US average refiner margin was 46 cents. However, in July 2009, the Alaska refiner margin spiked again to $1.02 per gallon, while the Washington and US refiner margins both dropped, to 48 cents and 35 cents, respectively. Alaska: Apply for Your 2010 PFD Starting January 1 - The 2010 PFD application period opens January 1, 2010, at 12:01 A.M. Filing is easy! Either go online to www.pfd.alaska.gov or obtain paper application forms in your community. If the division received a paper application from your household address in 2009, you will receive a packet which includes applications and the list of statewide distribution sites where additional forms and instructions can be obtained. A list of the 275 distribution sites are available by using the online lookup tool on the PFD website. While you may apply either on paper or online, online filing is the fastest way to submit your 2010 PFD application. Every qualified Alaskan, including first time filers, can apply for their PFD online or on paper. First time online filers will need to print and mail a signature page to complete their application. Any adult who received a 2009 PFD can set up a myAlaska account, using information from an Alaska driver's license or an Alaska ID, to electronically sign their or their children's application. Alaskans with a myAlaska account do not need to set up another account. Applicants who do not wish to use an electronic signature can still apply online and mail a printed signature page to the PFD Division. Visit www.pfd.alaska.gov to learn more about the electronic signature option or to set up a myAlaska account now. Alaska: New Alaska Minimum Wage Effective Jan. 1 - Alaska's minimum wage will increase to $7.75 an hour on Jan. 1, which is 50 cents above the $7.25 federal minimum wage. When Senate Bill 1 was signed into law in June, it increased Alaska's minimum wage for the first time in more than six years, in two steps. Ketchikan: IFA to Serve Metlakatla; Driver Travels Free on IFA - The M/V Prince of Wales will be serving between Ketchikan and Metlakatla, in addition to daily round-trip service between Hollis and Ketchikan, effective January 9, 2010 and until further notice. We have agreed to provide round-trip service daily except Tuesday and Wednesday, during the period when the Alaska Marine Highway's M/V Lituya is out of service for scheduled maintenance, said Inter-Island Ferry Authority's general manager Bruce Jones. The IFA ferry will depart Ketchikan at 11:30am, arriving Metlakatla at 2:00pm (Metlakatla time), and depart Metlakatla at 2:30pm (Metlakatla time), arriving Ketchikan at 3:00pm. Fares charged by the IFA will be the same as published for the M/V Lituya, including free transportation for the driver of a vehicle, effective January through April. Full restaurant service will be available aboard the M/V Prince of Wales. 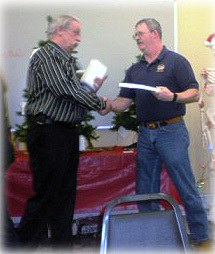 Ketchikan: NTFD Presents Fire Fighters Awards for 2009 - The North Tongass Volunteer Fire Department (NTVFD) held its annual awards ceremony December 12th. Awards, voted on by members of the department, are intended to acknowledge extra efforts made by members throughout the year according to information provided by Chief Dave Hull. Greg Brown, Firefighter of the Year. Ketchikan: AMHS Reschedules Matanuska's Return from Overhaul - The Alaska Marine Highway System ferry Matanuska will return to the 11-vessel fleet on January 26, 2010, following an extensive overhaul period in Ketchikan. The ship was originally slated to return to service Jan. 12. Passengers previously booked to travel aboard Matanuska have been reassigned to sail aboard the Taku. While the Matanuska remains in overhaul status, the ferry Taku and its crew will continue to provide service along Matanuska's regularly scheduled routes.